The Story Of "Rugrats In Paris"
This is Kimi's mother, Kira Watanabe, who is Coco LaBouche's secretary at Euro Reptar Land, and who will marry Chazz in the new film. ...or is this Chuckie's new mother? This is Coco LaBouche, a ruthless, domineering woman who runs Euro Reptar Land. She cares about Chazz only because she cares about marriage, and she's not doing this out of love or romance (which she lacks both of). And, she cares even less about Chuckie, because she dreads children like the plague. The storyline will begin on TV, with a 90-minute episode called Acorn Nuts And Diapey Butts. In that episode, Grandpa will meet the woman of his dreams, Lulu (Debbie Reynolds); then, offstage between the TV episode and the movie, marry her. Also in that episode, Chazz will begin dating again, while Stu invents a robot to be used at Euro Reptar. In the movie, we pick up with a Rugrat-ised version of another Paramount blockbuster, The Godfather (1972), where Angelica plays "The Bobfather". This segues into a wedding reception for our new newlyweds, complete with a DJ spinning the latest hot wax (Casey Kasem). The whole family is there except for one person -- Chuckie's mother, Melinda, who, of course, has died awhile back. Soon after, the gang goes to Paris, where Stu has been hired by the Euro Reptar theme park to fix one of the robots, which Stu designed. It is there where the Rugrats meet a new girl, Kimi (Dionne Quan). Unfortunately, it is also there where they met Coco LaBouche (Susan Sarandon), who runs Reptar Land, but hates Reptar's little, juvenile fans. However, she is interested in both Chazz and Chuckie, because she wants a husband and child for her own (to cover up a lie she made to the park's owner, Mr. Yamaguchi), and she'll do whatever it takes to get them. Surprisingly, Angelica helps Coco out in her hunt, while the Rugrats try to steer Chazz towards Kira (Julia Kato), who is Coco's secretary. Coco's close assistant is Jean-Claude (John Lithgow), who secretly dislikes what she does (see below for a little disclaimer). And in this film, a Rugrat will speak its first words directly to the grown-ups, but I'm not saying who or what -- you'll have to see the film or read the books to find out. Of course, this one big, happy new family will stay together for years to come on the TV series, starting with Finsterella; serving as an epilogue to the film, the newlywedded Chazz and Kira formally adopt each other's children. Channels in some countries may show Angelicon / Dil's Binkie / Big Brother Chuckie first (which is first in production order), but Finsterella is the real starting point for the post-Paris episodes. Wishes come true in Rugrats in Paris -- The Movie, and love makes its way into the hearts of those young, old and overseas. Chuckie's dad, Chazz, starts dating again, and it's Chuckie's wish to find a new mom. When Stu Pickles is summoned to Reptarland, an amazing new amusement park in Paris, to work on his Reptar invention, Tommy, Chuckie, Angelica, Phil, Lil, Dil, Didi and the whole gang tag along to the city of romance. 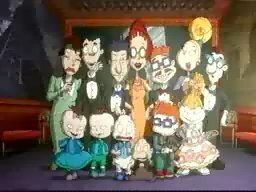 But the Rugrats' big adventure turns out to be more than glamour, fashion and smelly cheese. Chuckie learns that when it comes to princesses and potential mommies, things are not always what they seem, and for Chazz, finding the right woman can be difficult in any language. As the Rugrats' travels take them from the Eiffel Tower to Notre Dame and everywhere in between, the world's favorite babies learn new lessons about courage, loyalty, trust and above all, true love.